The flower design of these studded earrings is sure to attract attention with five glistening petal-shaped cubic zirconia stones. 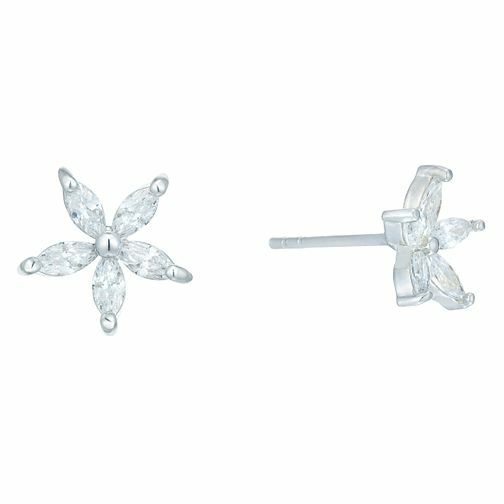 Sterling Silver Cubic Zirconia Flower Stud Earrings is rated 4.7 out of 5 by 3. Rated 5 out of 5 by Anonymous from Really pretty earrings My daughter bought me these for Christmas, I loved them but then I lost one which I was very sad about. So I went online and ordered another pair...arrived really quickly and I am happy again. Rated 4 out of 5 by Anonymous from Amazing The earrings I bought were just brilliant! My friend loved them as her 18th birthday present. I would highly recommend!